On June 22, 2018, the United State's government awarded a $1.12 billion contract to Lockheed Martin to manufacture and deliver 16 new F-16 Block 70 V, a combat-proven 4th Generation multi-role fighter aircraft to Royal Bahraini Air Force (RBAF). The deal will run through to September 30, 2023. The Kingdom of Bahrain is the first customer to procure the F-16 Block 70, the newest and most advanced F-16 production configuration. In February 2017, Trump administration resumed talks related to the F-16 sale to Bahrain which was earlier blocked by the Obama administration due to concerns about human rights in the kingdom. In September 2017, U.S. State Department approved a possible Foreign Military Sale (FMS) to the Government of Bahrain of 22 new F-16Vs, and upgrades to it's existing 20 F-16C/D Block 40 aircraft to bring them up to the same configuration. According to the press statement issued at that time - "This proposed sale will contribute to the foreign policy and national security of the United States by helping to improve the security of a major Non-NATO ally, which has been and continues to be an important security partner in the region. Our mutual defense interests anchor our relationship and the Royal Bahraini Air Force (RBAF) plays a significant role in Bahrain's defense." Later, in November 2017, another contract was awarded to General Electric (GE) for an undisclosed quantity of GE F110-GE-129 engines related to widening up the Bahraini F-16V procurement. The deal was the part of $643 Million contracts — to provide spare fighter aircraft engines to Qatar, Saudi Arabia, And Bahrain. Also, the deal came along with "Service Life Extension Program", which contributes to the financial bottom line by doubling time-on-wing, according to GE on its website. The core of the F-16V configuration comes with a Northrop Grumman’s APG-83 SABR AESA fire control radar which provides 5th Generation air-to-air and air-to-ground radar capability. On October 16, 2015, Lockheed Martin successfully completed the maiden flight of F-16V marking the first time an F-16 to be flown with Northrop Grumman’ radar system. Another key feature of the F-16V configuration is the new Center Pedestal Display (CPD) developed by Elbit Systems of America, a subsidiary of Israeli defense company. The CPD (also known as Common Color Multi-Function Display - CCMFD, provides critical tactical imagery to pilots on a high-resolution 6”x 8” screen. The display allows the pilot to take full advantage of AESA and Targeting Pod data. 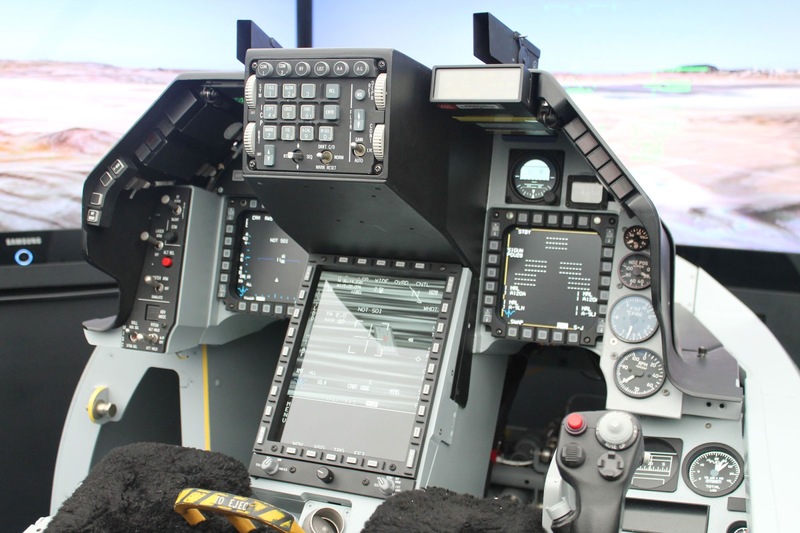 According to the company's statement -"The new CPD enables color moving maps, larger and easier to manage air-to-air situation displays, zoom functionality with the ability to switch information among displays, and digital display of Flight Instrument Data". The CPD is also compatible with the Night Vision Imaging System (NVIS) and it also comes with open modular architecture allowing easy integration of customer's or third-party software applications. Lockheed Martin expects this particular F-16 deal will create between 150 and 200 new jobs in Greenville, South Carolina. Currently, F-16 production supports hundreds of U.S.-based Lockheed Martin engineering, procurement, sustainment and customer support jobs and thousands of U.S. supplier jobs. The F-16 supply chain is currently supported by 450 U.S. suppliers spread across 42 states. According to the company's press release - "The combat-proven F-16 continues to prove itself as the world's most successful, combat-proven multi-role fighter. To date, 4,604 F-16s have been procured by 28 customers around the world. Approximately 3,000 operational F-16s are flying today with 25 leading air forces, including the U.S. Air Force." In the first quarter of 2018, Lockheed Martin Aeronautics reported net sales of $278 million, which were up 7% year-on-year due to increased production volume in its F-35, F-16, and F-22 programs.